Two external antennas to extend the more stable stronger signal to deadspot. 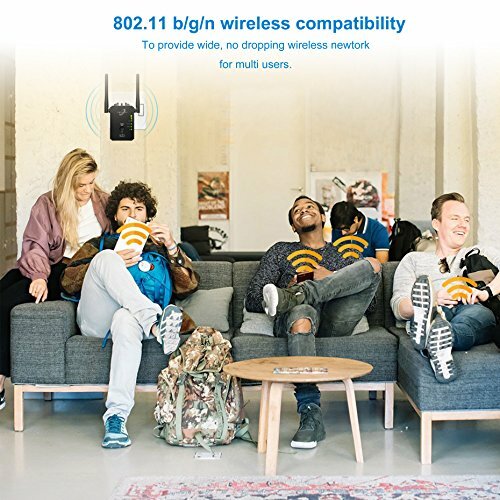 300Mbps transmission rate to support multiple wireledd enabled devices at the same time. 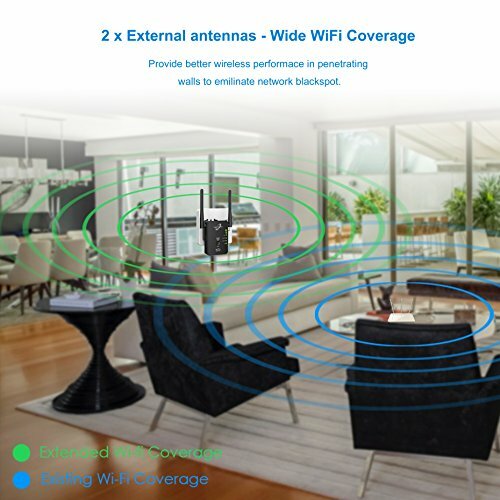 ?Boost WiFi Coverage: The dual antennas Wi-Fi range extender has greater coverage, which can extend the existing WiFi coverage to hard-to-reach areas, perfectly amplifying the WiFi signal(Not WiFi speed). Allows more users to share one account to access the Internet. ?300Mpbs transmission rate: It can also easily expand and enhance 2.4g network. Boost your existing network range, Provides a network speed of up to 300Mbps. Which makes it easy to access internet even in some hard-to-reach areas. 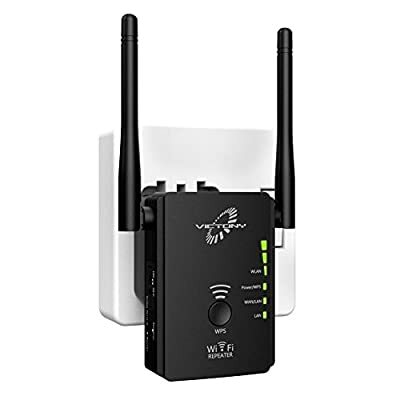 ?Easy Installation: Easily expand wireless coverage at a push of the WPS button; or browser-based configuration, accessible from almost any device, including iOS and Android mobile platforms. 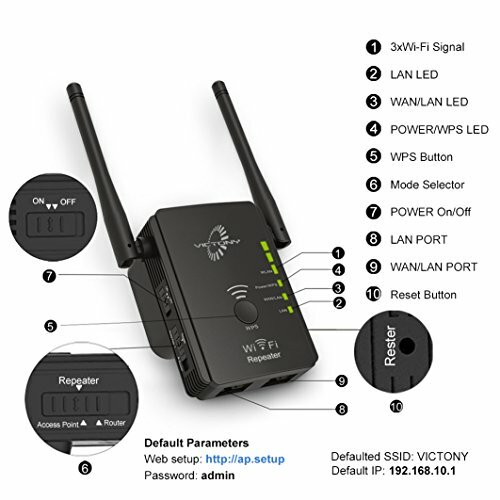 Smart LED signal indicator helps you find the best location ?3-MODE-IN-1 : 3-in-1 Repeater, access point, router. 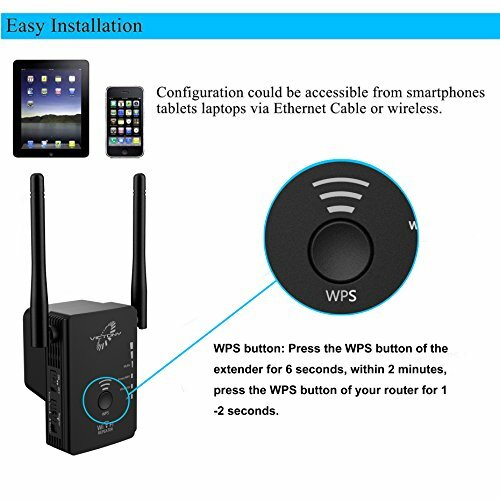 In access point (AP) mode, it can be connected to any wired LAN TO create a new Wi-Fi access Point, allowing the Internet connection to be accessed from laptops, tablets, phones or other Wi-Fi devices ?Universal Compatibility Device- It is the best solution to extending wifi to security camera, IOS devices, Android devices, PCs, PlayStation, smart TV, smart light switch, smart ring doorbell, smart sockets and more smart devices, etc. And more, it is compatible with Alexa assistance, google home. Then you will have a powerful smart life.